Image from the GREAT Awards program. 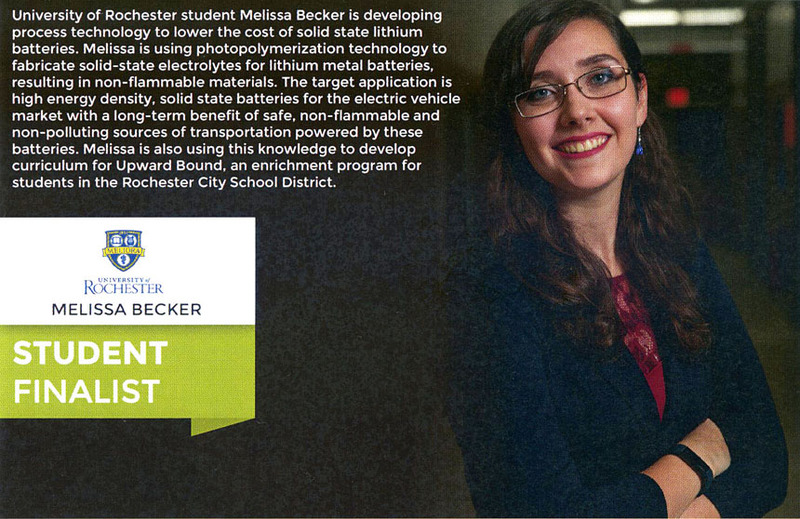 Melissa Becker ’17, now a master’s student in the lab of Assistant Professor Wyatt Tenhaeff, received a Student Achievement Award at Digital Rochester’s 2017 GREAT Awards ceremony last Tuesday. Becker was nominated for the award by Tenhaeff to recognize her work on making polymer-ceramic mosaics that could make the production of solid state lithium batteries more industrially feasible. This was initiated as a senior design project. Becker “represented the University and our department very well, and I am very happy for her,” says Tenhaeff, who attended the ceremony. Digital Rochester is made up of professionals and companies working together to strengthen the Greater Rochester Area’s technology business community.